Hawkins also wrote a detective novel, The Cowled Menace (1930), and Castaways of Plenty: A Parable of Our Times (1935), which the online Encyclopedia of Science Fiction calls "an anti-capitalist satire set in the near future." Willard Hawkins founded The Student Writer magazine in 1916. His World Press, Inc., of Denver, Colorado, published non-fiction books on the West and Hawkins' own Castaways of Plenty. He was also an editor associated with the Denver Times and Rocky Mountain News, and was editor himself of Rocky Mountain Hotel Bulletin and American Greeter. I can't let this article go without mentioning Willard Hawkins' wife. Willard E. Hawkins died on April 17, 1970, presumably in Craig, Colorado, where he was buried. As the publisher of a magazine for student writers, Hawkins would probably have known about new markets. Maybe that's how his own story ended up in the first issue of Weird Tales. If you do an online search for Willard E. Hawkins, you will find snippets on his career in places here and there. Willard E. Hawkins, a native-born Westerner, took naturally to Westerns. He wrote dozens during the pulp era. 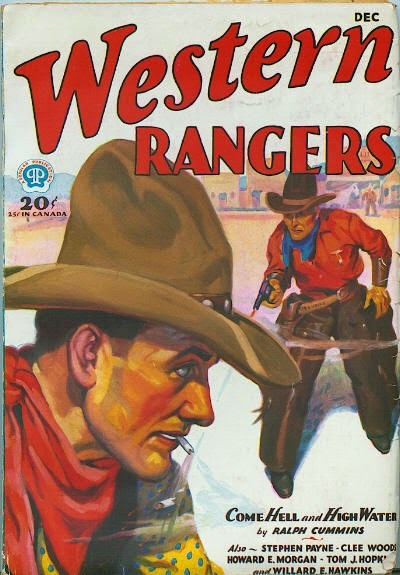 His byline is on the cover of Western Rangers for December 1930. 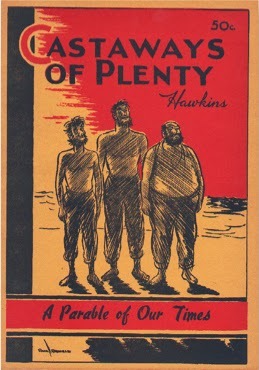 Hawkins' own World Press, Inc., reprinted his novel Castaways of Plenty in 1940. I read the Dwindling Sphere in German when I was young. Never forgot about that story. The topic - long-term ecological survival of mankind or rather myopia and self-destruction - was really an unlikely one in 1940. And a very important one today, to me at least. I plan to use it in the context of story-telling about the climate and energy crisis. At the time I thought it was a great story idea-wise, but was unsure about the quality of the writing. I've downloaded it in English and will have another look at it. Anyway, a great tale.